oh those twin hearts...I can fell the heart beats. Love the red one..
Beautiful and romantic dear Leovi! I see just a tiny touch of blue. Thanks for sharing. You create the best when it comes to abstracts. Love this one. This is wonderful, beautiful composition and colors. 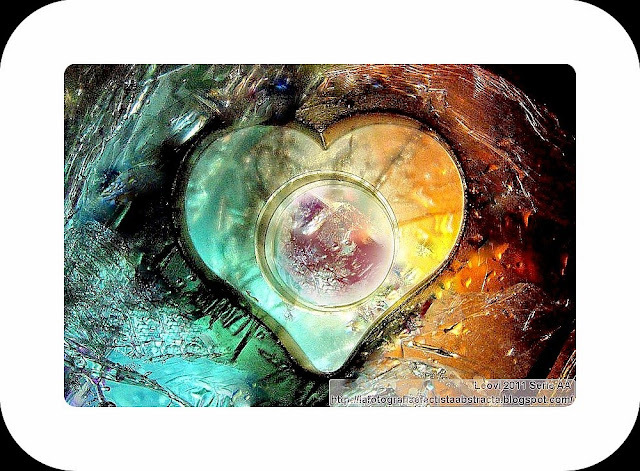 Beautiful shots of the creative heart! As I look at the composition I can see a few faces and yet I showed it to my husband and he could see something totally different. Dentro del corazón, ahí donde se van dorando al calor de los sentimientos todos aquellos ingredientes que uno a uno, sensación a sensación, se fueron integrando hasta elaborar una dulce base. Disponiendo del molde adecuado, el resultado no puede ser otro que una sabrosa y sólida complicidad entre fondo y forma. Sí Juncal, me gustaría que fuese así de bonito, como tu lo dices. Love the heart, very pretty. That's a nice romantic one heheh! The red is really stunning. Nice composition. Lovely work and the title really goes well with your art! Belle, questi cuori sono pieni di sentimento. Love the heart, beautiful and creative images. Have a happy day! Such beautiful colors, I love the heart! Muy bien conjuntado el titulo con la imagen, por cierto de gran belleza. Beautiful and unique. Always my pleasure to stop by and say hello. I love all three of these equally. Enjoy your week. How sweet! I love the heart! How beautiful this is Leovi I would love to hang it on my wall! I heart this abstract!!! Sooo cool! Happy #WW! Genial imagen.Buen lugar para guardar. oh! this is so precious and sweet!! love it. You know my fondness for hearts, these are no exception… beautiful! Wow I love that one! Unos corazones estupendos, espero que tengan su gemelo, jeje. Me encanta el resplandor de este corazón. ¡Felicidades!